← Dear Palestinians- Don’t Shoot At Me Over Trump, Join Me In Protest Against Trump. The first night I dropped by the synagogue in Tel Aviv University. There was a talk that was happening there, and they lit the candles before starting the talk. Around campus, there were a lot of Hanukkiahs all over campus, one lighting above the doorway of the business building. The first night there were sufganiyot being given out to students at various buildings with menorahs being lit. Stephanie bought one for us and we lit ours on the first night as I worked on homework. As the nights progressed, more and more doughnuts found their way into everyone’s homes. We would see them on the streets left in boxes and on plates. There were artisinal stores with $10 sufganiyot and so by the end of eight days, people were sick of them. I made a joke that Hanukkah is eight days of Sufganiyot. Every night you knew which night of Hanukkah it was. The Hanukkiahs were literally everywhere. On streets, on street corners, in windows, lighting up the city hall and all over social media. For the seventh night, we went to Rabin Square where a giant four-story Hanukiah stands. The Chabad rabbis were there to give out the hanukiahs, a 14-year-old orthodox kid in a suit and hat sang Hannukah songs with a keyboard rabbi next to him. People took pictures, danced together with kids and dogs. 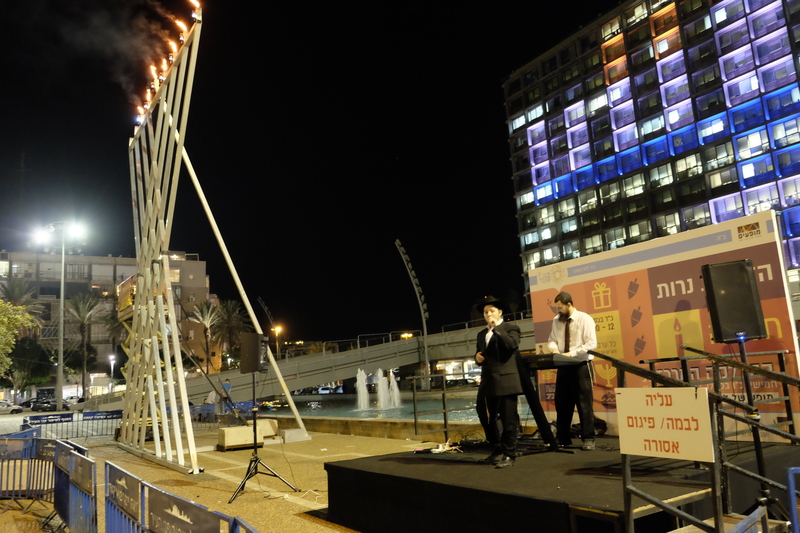 The rabbis went up in an elevator truck used to fix light poles and lit the candles which gave off columns of smoke. The stores were all decorated with Hannukah decor. Lots of gold and black all over town and at one restaurant where we took my mother, there were many dreidels to play with. We played and entertained ourselves as we waited for the food. It was strange to feel a Jewish holiday, being surrounded not by Christmas, but by my holiday, by people who celebrated my holiday. And if they didn’t celebrate it, they at least ate the Hanukkah donuts.